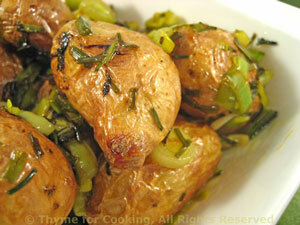 Roasted New Potatoes with Lemon, Green Garlic, Thyme for Cooking gourmet. Leave new potatoes whole and unpeeled; just wash lightly. Toss with 2 tsp oil and put into a baking dish large enough for them to be in a single layer. Stir half way through baking time. Could also be done on barbecue grill in a grill pan or basket. Just before potatoes are done: Trim and slice green garlic, using most of the green tops. Heat remaining 2 tsp oil in a medium skillet. Add green garlic and sauté until tender, about 5 minutes. Add chives, lemon juice and potatoes. Stir / toss to combine and coat potatoes.